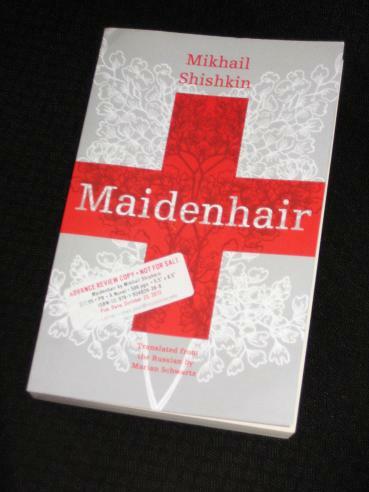 Mikhail Shishkin’s Maidenhair (translated by Marian Schwartz, review copy courtesy of Open Letter Books) has been touted as an instant classic. The five-hundred page novel starts off in Switzerland as a story about an interpreter for Russian refugees, a man who must listen to the stories of atrocities they spin in an attempt to prolong their stay in the country. Very soon though any idea of a straight narrative is abandoned. Shishkin creates a tangle of intermingled strands, zipping backwards and forwards in time and space, alternating between fiction and reality (whatever that is). As well as following the unnamed interpreter in his work (and on his travels), the reader must navigate the books the interpreter is reading, the postcards he writes (but never sends) to his son, and the diary entries of a famous singer and actress whose biography he was once commissioned to write. Moles, yep, we are all moles. Let’s move on. I'll agree on withholding judgment as an “instant classic” but it's a juicy read. It resides somewhere between 'disturbing' and 'haunting'. I definitely plan on rereading it down the road, which is a high recommendation for me. Thanks for the review on such a challenging book! Dwight – I'd go for 'confusing' at times 😉 Definitely one that needs to be reread a few years down the track, the kind of book that more people should read (but don't…). St Thomas Aquinas had a vision of heaven, where the righteous can enjoy their beatitude & the grace of god more richly by being granted a perfect sight of the damned, suggesting the idea that you can be happy whilst others are not. This does sound like something I could find enjoyment in, great post. ” there is a lot here that is Joycean too” A truly Joycean novel by Shishkin is The Capture of Ismail. I wish it was available to the English reading public.